Rhapsodic acoustic guitar and creative original songs from an Irishman. Many connections with Irish folk and traditional music, but this album goes far beyond that. "His works are simple, elegiac and exquisitely worded pen pictures of life's experiences." "He's a lovely singer, a powerful performer and a master musician." The Holy Ground) is best known sung by others, Gerry reclaims his songs. He involves the listener with a gentle intensity that allows the beauty of his melodies to envelop and sweep them along: images abound of mountains and deserts, foreign lands, and County Clare, loves lost and loves won." "The highlight of the recent Waterboys concerts at the Olympia Theatre was a truly mesmerizing bottleneck solo.....by guitarist Gerry O'Beirne." "Material comes from Paul Brady, Mary Chapin Carpenter, Shawn Colvin and Lennon & McCartney, but the highlight is Gerry O'Beirne's beautiful 'Half Moon Bay'." "He should be compulsory listening for any aspiring ambitious guitarist. It's not just his technical dexterity and brilliance that catches the imagination, it's the inventive use of arrangements, lyrics and melody." "Intelligent, articulate, insightful musicianship from a real craftsman. Not a wasted word nor an untrue note ." "He plays guitar like an elephant roller skating through neon grass." Born in Ennis, County Clare, along Ireland’s music-rich west coast, Gerry O’Beirne is a renowned singer, songwriter, and multi-instrumentalist (6 and 12 string guitar, tiple, and ukulele, slide guitar among others). Gerry grew up in Ireland and in Ghana in West Africa, and has since lived in England, California, and Mexico. Gerry’s own compositions blend the passion found in traditional music with the freshness of contemporary song. Many of his songs have been embraced by the contemporary folk community. Maura O’Connell recorded Half Moon Bay, Western Highway, Shades of Gloria, and The Isle of Malachy. Mary Black recorded The Holy Ground as a title track. Cathie Ryan recorded Shades of Gloria and The Lights of San Francisco. Muireann Nic Amhloaibh has recorded Western Highway and The Isle Of Malachy on her album daybreak: fainne an lae. Gerry has toured the globe as a solo artist and with the Sharon Shannon Band, Patrick Street, Midnight Well, Andy M. Stewart, Kevin Burke, Andy Irvine, and the Waterboys. He has performed at the White House, opened for the Grateful Dead, and played electric guitar with Marianne Faithfull. He composed and recorded the score to River of Dreams, an artistic response to the River Shannon commissioned by the Irish Department of Arts and Heritage, and he has written music for film and theater. As a producer, Gerry has a large number of albums to his credit, including Promenade by Kevin Burke and Michael O’Dhomhnaill (winner of the Grand Prix Du Disque at Montreux), Irish Times by Patrick Street, Man in the Moon and Donegal Rain by Andy M. Stewart, First Foooting by Anam, The Connaughtman’s Rambles by Martin O’Conner, Up Close by Kevin Burke, Lifting the Veil and Sacred Space by Fiona Joyce, To Anyone At All by Clandestine, Fine Small Storm by Jen Hamel, The Willow by E. J. Jones, Silver Hook Tango by Australian singer-songwriter Kavisha Mazella, and most recently Lumina by Irish piper, low whistle player, and composer Eoin Duignan, which was hailed “a stunning achievement” by Hot Press, Ireland’s foremost music magazine. Gerry’s solo album, Half Moon Bay, features his own songs and instrumental compositions. Half Moon Bay was citied as one of the 12 best releases of the year by Performing Songwriter magazine and was chosen as one of Folkworld’s Top Ten Albums of the year. Gerry has toured recently in Holland, Australia, New Zealand and the USA, performed solo at the Kennedy Center in Washington DC, and has taught musical composition from visual art at Swananoa Music Camp. He is currently at work on his second solo album, which will feature his completely original and compelling instrumental music, and an album with fiddler Rosie Shipley. 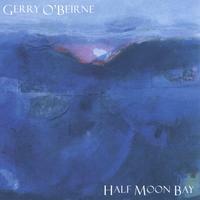 If I was to be locked in my studio for a month with only one cd to listen to while I created my art, Half Moon Bay by Gerry O'Beirne would be my first pick. I am salivating for more, Gerry... Please??? This is a favorite album for me to share with those I know appreciate incredibly fine music. A gift sure to please listeners and musicians alike. Be sure to see him perform his music, in fact go to great lengths if necessary. Gerry O'Beirne's voice is the most beautiful tenor I have ever heard. Almost painfully beautiful! I am smitten. I've must've bought five or six copies of this CD by now, whenever I feel the urge to share something of surpassing beauty with a friend. I discovered the music of Gerry several years ago. Not only is he a wonderful vocalist, and an extremely talented guitarist, he writes some of the most beautiful, evocative songs I have heard. The Shades of Gloria alone would be more than worth the price of this CD as it is one of the most beautiful songs I have ever heard and believe me I hear a lot of music. As with another of the reviewers I must have bought a dozen copies of this since it came out and given it to friends. Gerry's song writing and voice come through with a calm and reflective strength. Western Highway is my favorite; placing my mind back into the long drives I've made cross-country, enjoying the essence of the landscape as I passed through. Off The Rocks At Clahane and When You're Gone I Say Your Name tells stories that you can see in your mind's eye. Great stuff! Can't wait for more! I buy and give away this CD often. I bought HMB years ago, and it got lost somewhere along the way.. computer upgrades made, files lost, discs misplaced. I finally broke down and redownloaded it (mp3 this time) and was instantly transported back by your masterful music. Thank you, Gerry, for being a talented human on this planet. I like his playing and his gentle voice. I hope this album gives him the recognition he deserves. He is a very talented player and I hope that this album earns him a fortune, it should do! Although he's been around for a while but a lot of people haven't heard of him, I hope this changes, soon. P.S. Get your next album out soon!! !